So, I love to make pie. I love to eat pie. I love when other people eat pie that I’ve made. If there were other things to do with pie, I’m sure I’d love doing those, too. With every good slice of pie, there’s a (hopefully) good crust. Everyone has their own way of making pie crust, too. Butter or shortening. Egg or no egg. Vinegar. Cold water. Sugar or not. This crust recipe comes from Ken Haedrich‘s pie bible: PIE, one of my favorite cookbooks of all time (I had it checked out from the library for months at a time. I eventually had to buy my own because I got tired of racking up late fees!) It’s got shortening for flakiness and butter for flavor. It’s chilled to make it easier to handle and it bakes up like a dream. I’ll be posting a pie recipe soon and this is the crust I use! Start with your flour, sugar and salt. 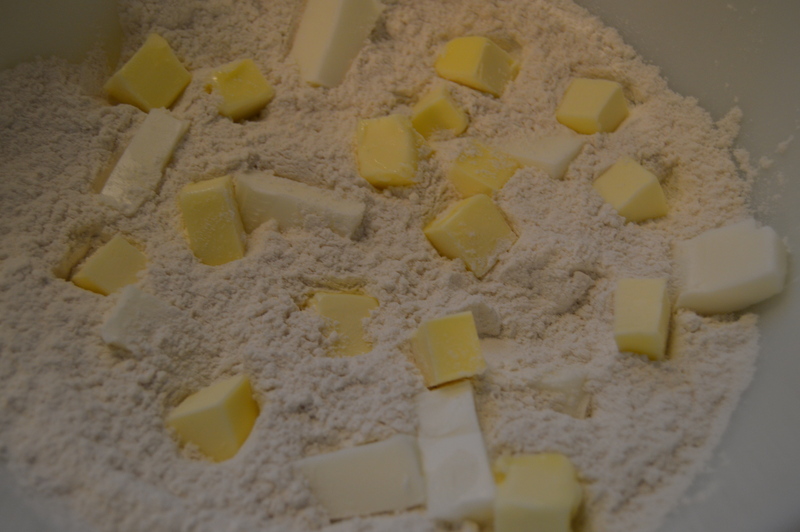 Cube up the shortening and butter and dot them randomly into your flour mixture. Give ’em a toss to make sure all the pieces are well coated. 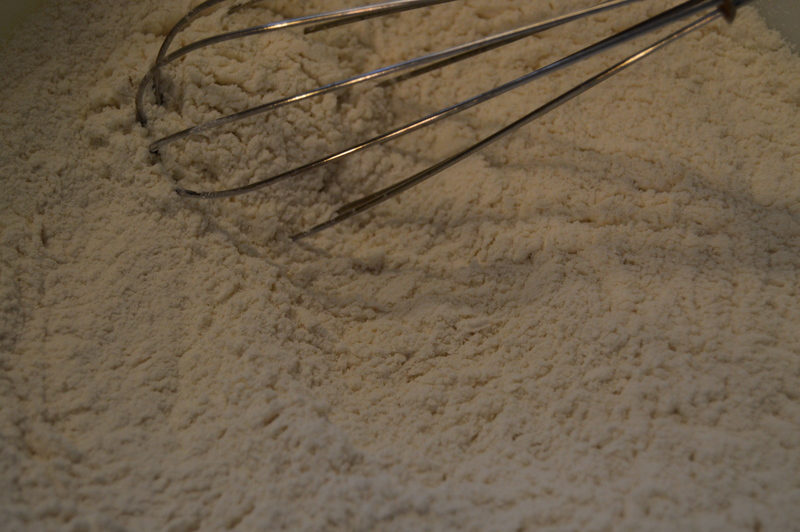 Using your pastry blender (or two knives or your fingers) cut the fat into the flour. You’ll have roughly small pea-sized chunks when you’re done. Drizzle the cold water over the mixture. Start with about half the water and add more as needed. Using a spatula (Ken recommends a fork and he’s right, a fork is good for this and it’s what I normally use. Don’t ask me what I was thinking with the spatula. ), toss the mixture around scraping up from the bottom and giving it a toss. 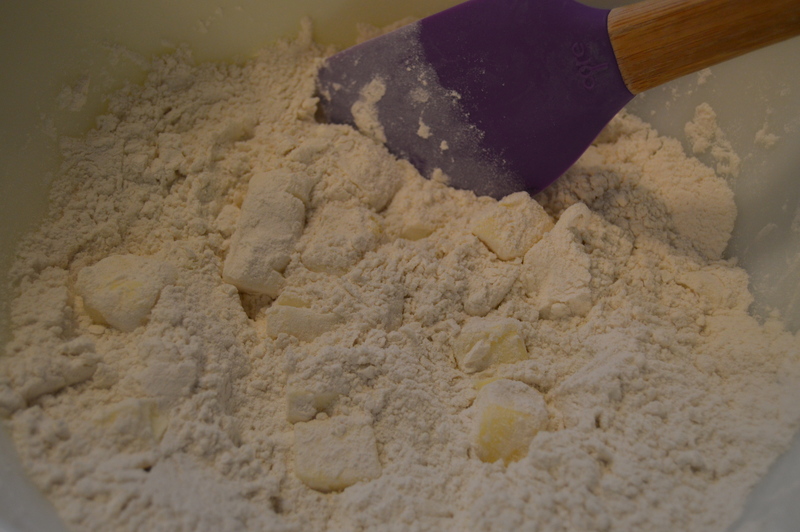 Kind of like folding the dough in on itself and making sure as much of the flour is incorporated as possible. You may need to add more water when mixing by hand. 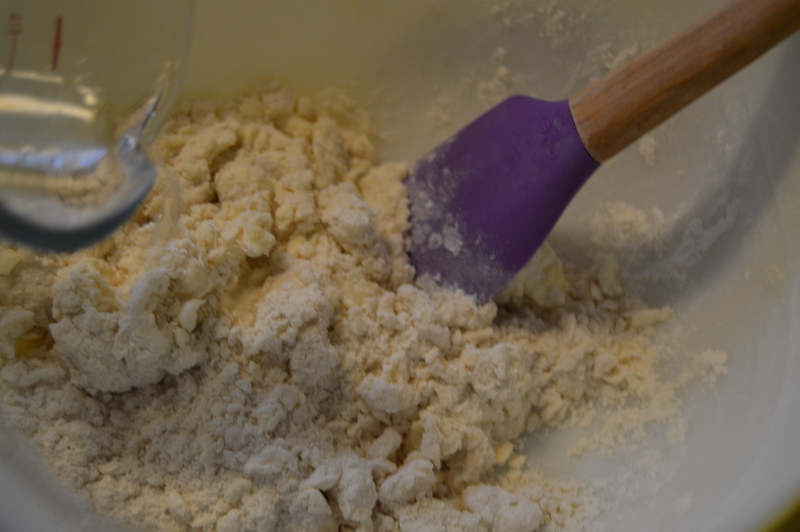 I kept sprinkling on a little water and tossing the mixture around until there was no dry flour left underneath and I could compress the mixture into a ball. 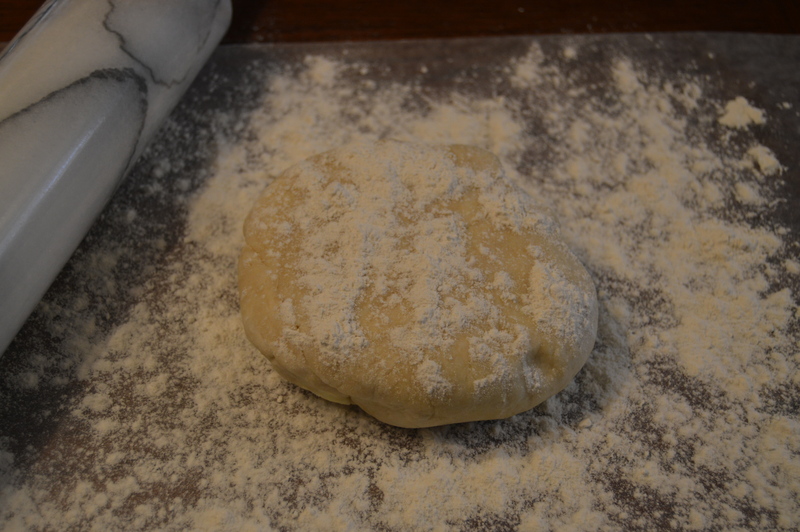 Lightly flour a work surface and turn your dough ball out onto it. Lightly sprinkle with flour on top. 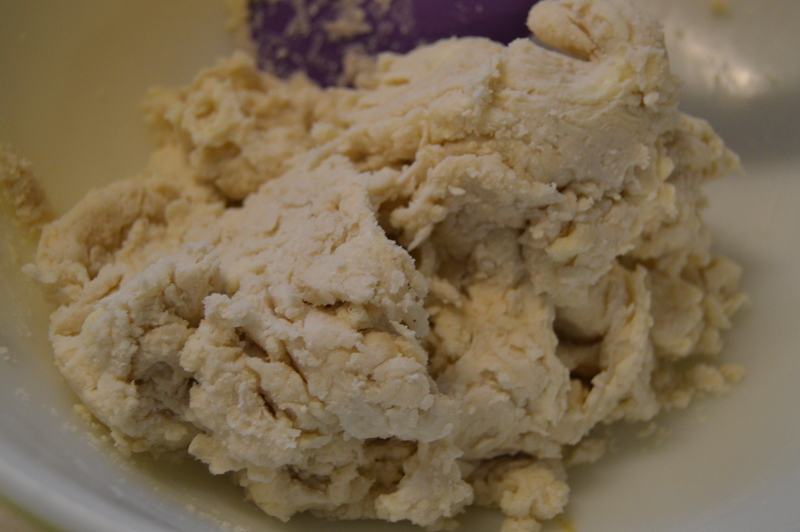 Knead the dough 2-3 times until relatively smooth. DON’T overwork the dough or you’ll have a tough pie crust! Flatten into a 3/4″-1″ thick disk and wrap in cling wrap. Now, pop that baby in the fridge for NO LESS than 30 minutes but and hour is really best. I was in a bit of a rush this time so mine probably only got about 30 minutes. It wasn’t the end of the world. 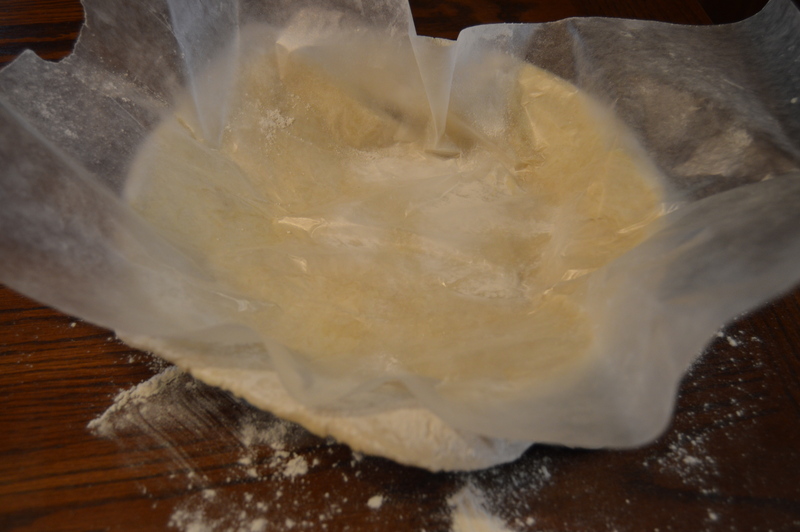 When you’re ready, lay out a sheet of waxed paper and sprinkle lightly with flour. 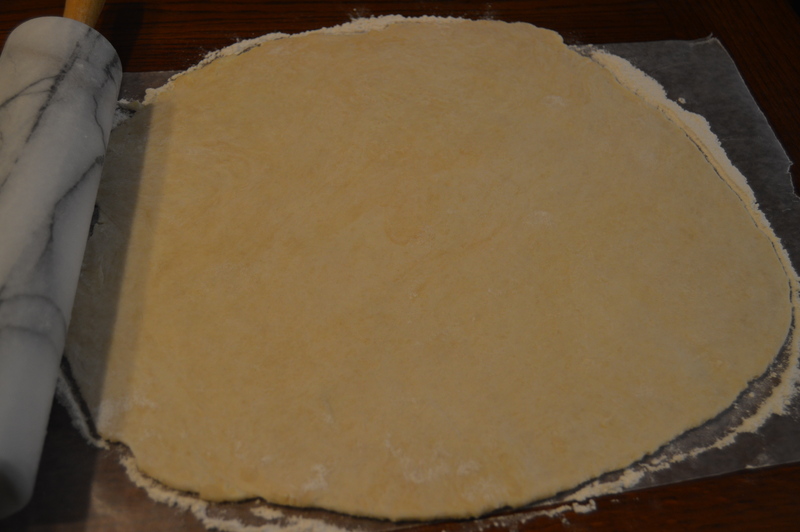 Roll your dough out into a 12″ circle. Now here’s the fun part: don’t roll the dough around your pin or fold it in quarters and try to get in it your pan, oh no! You’re going to take your dough, waxed paper and all and flip it, dough side down, into your pie pan. Get it centered then peel off the waxed paper by pulling it straight back towards you (not up and away). Make sure you pie dough is tucked into the pan nice and neat. Trim the rough edges and use your preferred crust finishing method. I use my left thumb knuckle and two fingers from my right hand to crimp the edges. 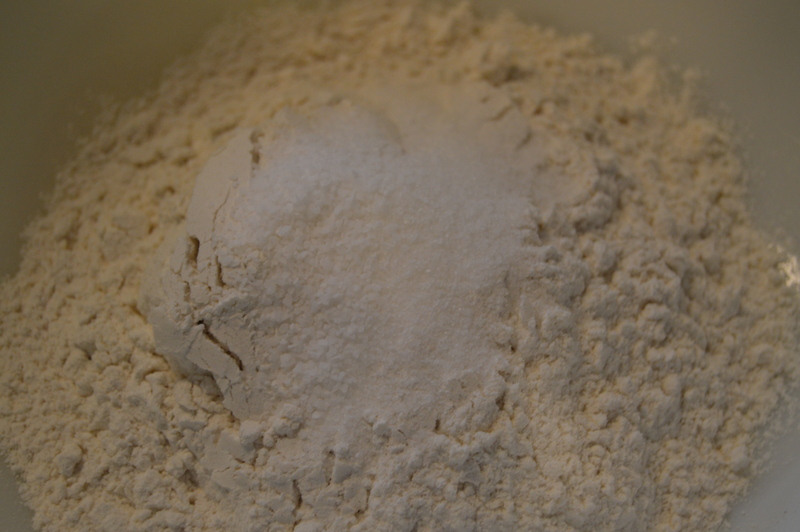 Combine flour, sugar and salt in a large bowl. Whisk together to combine. 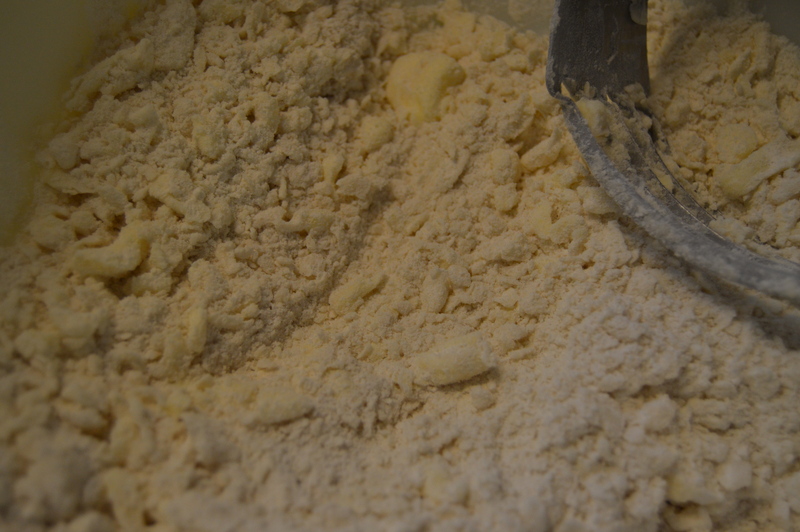 Scatter butter and shortening over the flour and toss to coat. 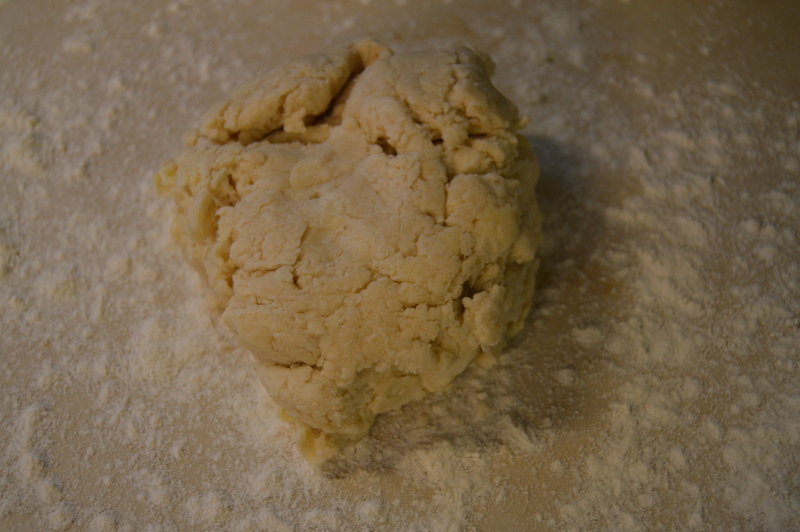 Work the fat in with your pastry blender (or two knives or your fingers) until the mixture resembles small peas. Sprinkle half the water over the mixture and toss well with a fork to dampen the mixture. Add remaining water 1 1/2 to 2 tablespoons at a time and continue to toss and mix, pulling the mixture up from the bottom of the bowl on the upstroke and pressing down on the downstroke. Dough made by hand often needs a bit more water. 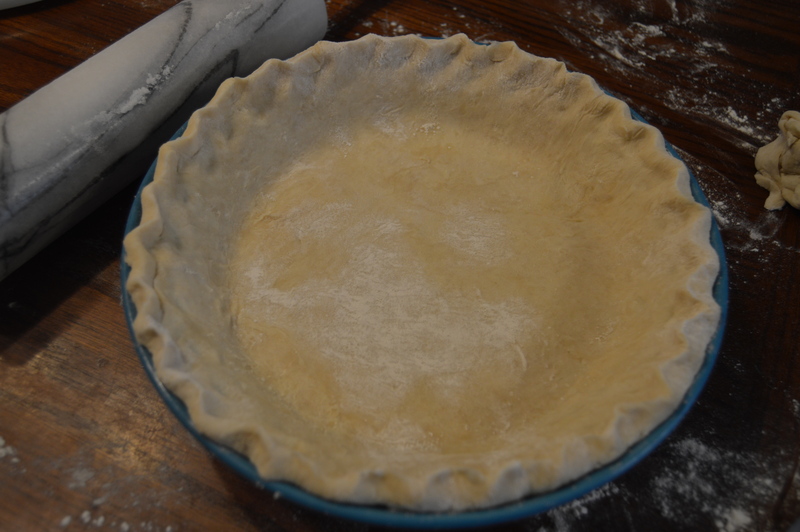 If necessary, add water 1 or 2 teaspoons at a time until pastry can be packed. Using your hands, pack the pastry into a ball. 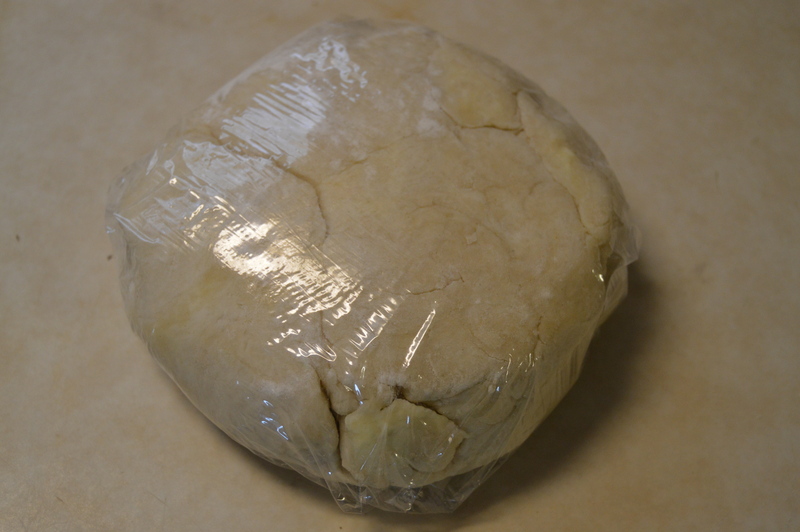 Knead once or twice then flatten into 3/4″ disk and wrap in plastic and refrigerate for at least an hour or overnight before rolling. Tips: Refrigerating the dough is super important because it helps the fats solidify again and makes the dough easier to handle. I probably only chilled mine for a half hour and it ended up working out just fine for me, but I’ve also made a lot of pies and I have a pretty good ‘feel’ for the dough and what it should look and feel like. If it’s too soft, chill it another 30 minutes and it should be easier to handle. Ken also suggests chilling your pie shell once you have it in the pie pan so it can set up again and be more sturdy for when you add the filling. I often do that but this time I was in a rush so I skipped that step.